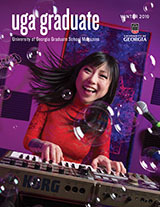 To give our students a competitive advantage after graduation while helping lower the overall cost of a college education, the University of Georgia is launching The UGA Advantage (also known as Double Dawgs), an ambitious program that will create structured pathways for qualified students to earn an undergraduate and graduate degree within a five-year timeframe. Our goal is to offer students a significant number of linked undergraduate/graduate degree pathways through this innovative dual degree program. For more information, visit the Double Dawgs website.